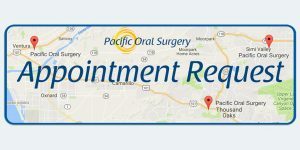 After wisdom tooth extraction surgery, please follow Pacific Oral Surgery’s Wisdom Tooth Removal Postoperative Instructions. 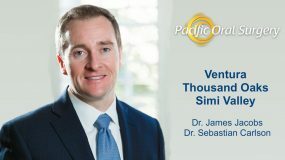 We believe this will give you the best chance of a quick recovery and optimal postoperative results. Rest quietly with your head elevated. Keep a steady pressure on the bleeding area by biting gently and firmly on the gauze placed there by your doctor, making sure it remains in place. Pressure helps reduce bleeding and permits formation of a clot in the tooth socket. The packs may be gently removed after one hour. If active bleeding persists, place enough new gauze to obtain pressure over the surgical site for another 30 minutes. The gauze may then be changed as necessary (typically every 30 to 45 minutes). It is best to moisten the gauze with tap water and loosely fluff for more comfortable positioning. Do not disturb the surgical area. Bleeding after surgery may continue for several hours. Bleeding should never be severe. Try repositioning the packs. If bleeding persists or begins again, sit upright or in a recliner, avoid physical activity, use ice packs and try biting on a moistened tea bag for 30 minutes. The tannic acid in the tea leaves helps to promote blood clotting. If bleeding remains uncontrolled, please call our office. After 24 hours, some oozing of blood may persist. Pink or blood-tinged saliva may be seen for 2-3 days following the surgery and does not indicate a problem. It is not uncommon to ooze blood after surgery. Keep in mind that oozing represents a little blood and a lot of saliva. If oozing persists, replace with moist gauze as needed every 30-45 minutes. Swelling is the body’s normal reaction to surgery and will not reach its maximum until 2-3 days after surgery. It can be minimized by using a cold pack, ice bag, or a bag of frozen peas wrapped in a towel and applied to the cheek adjacent to the surgical area. This should be applied in intervals of 20 minutes on and 10 minutes off. After a time, the swelling should decrease but may persist for 7-10 days, and a fever of 99 degrees F to 100 degrees F is not unusual. 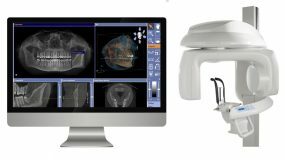 Unfortunately, most oral surgery is accompanied by some degree of discomfort. You may have a prescription for pain medication. Immediately following the procedure, begin taking medication as directed by your doctor to minimize discomfort when the anesthesia wears off. More severe pain may require a narcotic pain medication. First, take narcotic medication, then, a couple of hours later, take ibuprofen. Alternate these medications as prescribed. The prescribed pain medication will make you drowsy, so do not drive or operate machinery. The use of alcohol is strongly discouraged when taking prescription drugs such as pain medication, muscle relaxants, and antibiotics. Its use can cause potentially lethal interactions. Once you feel like you can stop the narcotic, use ibuprofen or Tylenol. Discomfort should subside daily. If not, please call our office. Application of an ice bag can also help relieve discomfort. You can fill two zipper lock bags with crushed ice, wrap the ice in a dish towel, and apply to the area. Some patients find that stronger pain medicine causes nausea, but if you precede each pain pill with a small amount of food, chances for nausea will be reduced. Post-operative nausea is usually self-limiting, and sipping on flat ginger ale often helps. If nausea persists, stop taking the pain medicine and substitute an over-the-counter pain medicine for the next dose. If nausea continues, call our office. If a dry socket occurs (loss of blood clot from socket), there is constant pain that may radiate to other areas including ear, jaw, and teeth. Symptoms of a dry socket usually do not occur until the 3rd to 4th day after the procedure. A medicated dressing may be placed if medications do not resolve the discomfort. 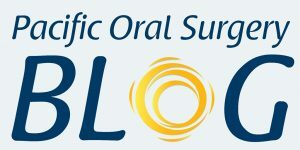 To help prevent a dry socket, avoid vigorous rinsing, sucking on the wound, spitting, using a straw, smoking, and exercising for 2-3 days after procedure. You may gently rinse your mouth with salt water. Eat any nourishing food that can be taken with comfort. Avoid hot foods and liquids for the first 48 hours. Do not use a straw for the first few days after surgery. It is sometimes advisable to confine the first day’s intake to liquids or pureed foods (soups, puddings, yogurt, milk shakes, etc.). Avoid chewing food until tongue sensation has returned. Over the next several days, you may gradually progress to solid foods. It is important not to skip meals! If you take nourishment regularly, you will feel better, gain strength, have less discomfort, and heal faster. If you are a diabetic, follow instructions given by your doctor. Foods to eat and drink after surgery: While numb, patients should avoid hot liquids or foods. Diet may consist of soft foods, which can be easily chewed and swallowed. No seeds, nuts, rice, popcorn, chips, etc. Keeping your mouth clean after surgery is essential. It is the best way to prevent infection and ensure healing. You should brush your teeth the night of surgery, but stay away from the surgical sites. If there is minimal bleeding, saltwater rinses may begin 24 hours after surgery (mix 1 tablespoon of salt with 8 ounces of water). Swish gently and allow the water to drip into the sink. Repeat the process, taking five minutes to use the entire glassful. Rinses should be done 2-3 times a day, especially after eating. Mouthwash can be added for better taste. Do NOT rinse your mouth the day of surgery. For the first 48 hours, you should rest and relax with no physical activity. Activity after surgery should be limited to couch or bed rest for the first day. Bending, lifting, or strenuous activity will result in increased bleeding, swelling, and pain. You should be careful going from the lying down position to standing. You could get light-headed when you stand up suddenly. Exercise should be avoided for 3-4 days following surgery. Too much exercise in the post-operative period may result in increased bleeding, swelling, and discomfort. The first two days after surgery are generally the most uncomfortable, and there is usually some swelling. On the third day, you should be more comfortable and, although still swollen, can usually begin a more substantial diet. The remainder of the post-operative course should be gradual, steady improvement. Two to three days following surgery, white, possibly hard tissue may be seen in the surgical site. This cavity will gradually fill in with new tissue. This signifies normal, healing tissue. Complete healing of the extraction site may take 6-8 weeks. If you do not see continued improvement, please call our office. The development of black, blue, green, or yellow discoloration is due to bruising beneath the tissues. This is a normal post-operative occurrence that might appear 2-3 days after surgery. The site of the injection and arm may also be bruised, swollen, and tender to touch due to the IV. If you suddenly sit or stand from a lying position, you may become dizzy, especially if you have not eaten or had fluids. Therefore, immediately following surgery, if you are lying down, make sure to sit for at least one full minute before standing. Sutures will fall out on their own. It is normal for a suture to come out on the day of surgery. If bleeding occurs because some sutures have fallen out, bite on gauze to apply pressure as described in the “first hour” section above. If an antibiotic is prescribed, take as directed until it is gone. Antibiotics help prevent infection. Make sure to call the office if a rash or other unfavorable reactions occur. Sharp edges: If you feel something hard or sharp in the surgical areas, it is likely you are feeling the bony walls which once supported the extracted teeth. Occasionally, small slivers of bone may work themselves out during the following week or so. If they cause concern or discomfort, please call the office. Dry lips: If the corners of your mouth are stretched, they may dry out and crack. Keep your lips moist with an ointment such as Vaseline. Stiff jaw muscles: Trismus (jaw muscle stiffness) may cause a limitation in opening the mouth wide for a few days after surgery. This is a normal post-operative event that usually resolves during the week after surgery. After 36 hours, the use of warm, moist heat on your face over these muscles may help to speed up resolution of this problem. Earache: You may have a slight earache. Blurred vision: Do not be alarmed if your vision is blurred for a time following anesthesia. Aching teeth: Your other teeth may ache temporarily. This is referred pain and is a temporary condition. Smoking: We suggest that you do not smoke for at least 5 days after surgery. Nicotine may break down the blood clot and cause a “dry-socket” which is an undesirable side effect. Women please note: Some antibiotics may interfere with the effectiveness of birth control pills. It is our desire that your recovery be as smooth and pleasant as possible. 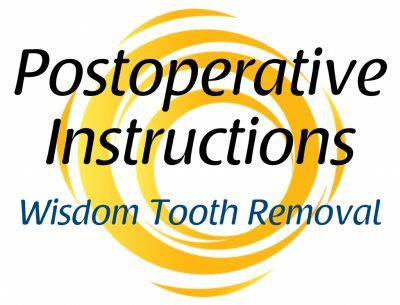 Following our Wisdom Tooth Removal Postoperative Instructions will assist you, but if you have questions about your progress, please call our office.